Saturday March 3rd, from 3:00 – 6:00 PM. Brewers who wish to share their beer should bring somewhere between 8 – 12 bottles, and should arrive by 2:30 so your beer can be worked into the “order of serving” in a panic free environment. 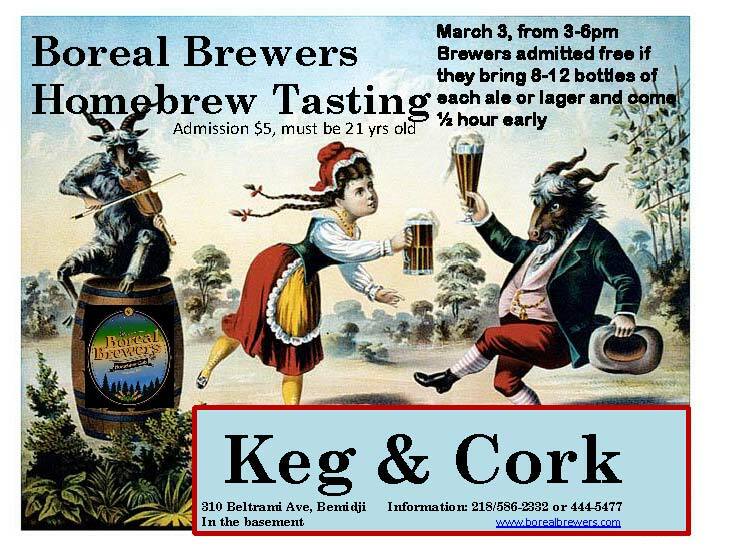 As usual, the tasting will be held in the basement bar at the Keg ‘n Cork in downtown Bemidji. Admission $5.00, you must be 21 to enter. Live music, bread for cleansing your palate between tastes, popcorn, 20 or more ales and lagers! It’s a pretty darned good time; try a bunch of new beers in a relaxed atmosphere, and try to learn to sing the “Barley Mow” at the close of the tasting. Brewers who bring at least 8 bottles of homebrewed ale or lager get in free! Come down to the basement bar at the Keg & Cork, 301 Beltrami Ave, in Bemidji. ← Annual Conference Registration is Open! It regulated the practices of drinking houses, and called for the death penalty for proprietors found guilty of watering down their beer.